Annual General Meeting of Friends of the Centre for Christian Studies Canada Inc.
7.01 Friends The membership of the Corporation shall consist of the applicants for amalgamation and such other persons as have the necessary qualifications set out in Section 7.02 hereof, or have been elected as members and admitted as the Friends of the Corporation by resolution of the Central Council. The number of Friends of the Corporation shall be unlimited. and who has indicated a wish to be a Friend of the Corporation. 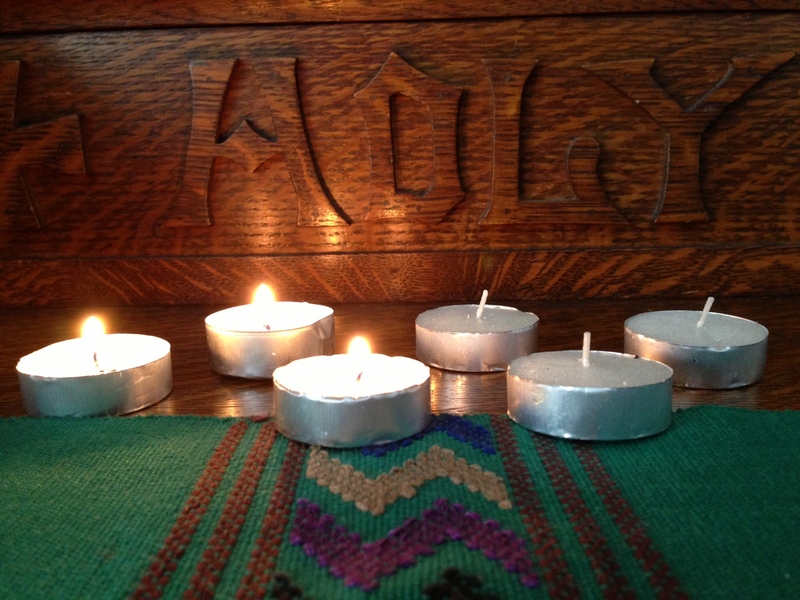 Preparation: You are invited to gather six candles wherever you are and light three of them. If you have a copy of the “Voices United” hymn book, you could have that on hand. …Thank you, Lori Crocker, for preparing the worship. Reader. Today is the fourth week of Lent. Lent is a time to think about the things that block us from following God’s way of loving and caring for this world and one another. Today we will extinguish our fourth Lenten Candle. This candle represents pride As the candle is blown out, let us pray in silence for the removal of any pride from within us and our world that makes us feel more important than others and stops us from hearing their voice and feeling their truth. Lenten Candle Song MV 85 Take, O take me as I am: summon out what I shall be; set your seal upon my heart and live in me. It occurs to me that the parable of the of the Prodigal Son paints a picture for us of a family on the verge of transformation. I wonder what it will take from each character – the father and the two sons – for transformation to happen? I wonder if the awakening of the younger son signals a true and lasting change in behaviour, attitude and approach to the world? I wonder if the punitive and self righteous approach of the elder brother can be turned around? Closing Song MV 138 My Love Colors Outside the Lines. Voice : May we be blessed on the transformational journey that is ours to make. We journey on our way. These are some of the diaconal themes that we try to instill in our Leadership Development Module, our Theme Years of Pastoral Care, Social Ministry and Education, our Integrating Year, and in a range of workshops and retreats. To do this work we rely on our highly capable and committed staff team, a company of contract staff, and a Canada-wide network of Friends and volunteers who facilitate student learning, mentor diaconal candidates, staff exhibits, sit on committees, and just get things done. We also draw from many financial sources: student tuition, grants from The United Church of Canada, workshop subsidies from Anglican dioceses, funds from a range of foundations, interest from our Endowment Fund, and above all, individual donations from Friends, graduates and former students. In the past year, this amazing array of human and financial resources made it possible to do the impossible. A Smart Start to the Year. We started in 2012 with the installation of two new Smart Boards thanks to a grant from the Winnipeg Foundation. They function as oversized interactive computer screens, and we use them for worship, for minute-taking, PowerPoint presentations, YouTube viewing – at staff meetings, Learning Circles, Finance Committee meetings, and lunch hours. When not in use, they are protected by a set of beautiful quilted covers made by students and Friends. The Winnipeg Foundation also helped us get a new roof and a paint job in time for our 120th Anniversary Weekend in September. In the spring and summer we developed a new look: a stand up banner, table cloth, brochures, and foam board signs were designed with CCS’s new “sunburst” look to help raise our profile at Conference Annual Meetings, Synods, and General Convention. But our graduates and volunteers who attended, presented, and staffed our displays were by far our most effective advertisement! Our new look was the gift of Saskia Rowley Fielder, a talented graphic designer who did it as a favour. Educating for Ministry that Transforms. Five students graduated at a Service of Celebration at which Charlotte Caron and Barbara Barnett were honoured as Companions of CCS. Twenty-nine women and men registered as Theme Year, Integrating Year, or Reflection Year students; twenty-four signed up for the Leadership Development Modules offered in Vancouver and Winnipeg. And about seventy Anglicans and Episcopalians participated in workshops and retreats led by CCS in the dioceses of Northern California, Rupert’s Land, Keewatin, as well as an Advent reflection series in the Winnipeg parish of St. Mary Magdalene. These short-term events are part of a strategy to extend our reach to Anglicans. The Second Fridays, a lunch hour learning series, help to extend our reach in and beyond Winnipeg, thanks to Ted’s planning and hosting role, and Scott’s videotapes on the website. These also serve to demonstrate how local communities can be effectively engaged in ongoing diaconal formation. 120 Years Young! The highlight of the year was the 120th Anniversary Weekend, October 11, 12, 13, and 14, 2012, which are well presented in the co-chairs’ report. It was an extraordinary coming together of current and past students, graduates, and former staff; a time of learning, reunion, celebration, and worship. 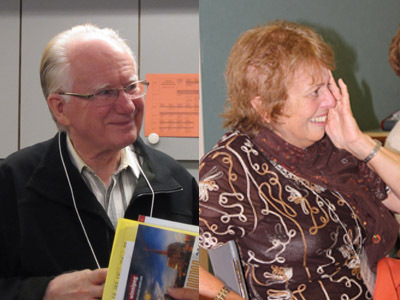 I was thrilled to see Ted Dodd and Ann Naylor receive the Davidson Trust Award for excellence in scholarship and teaching in theological education, to confer the Companion Award on Caryn Douglas, and to have Marion Pardy, Dorothy Peers, and Michael Peers acknowledged for their leadership of the Endowment Campaign. The St. Stephen’s Broadway Foundation helped to cover the costs of the opening lecture. Staff Changes. Marc Desrosiers’ resignation as Development and Communications Coordinator at the end of July was a low point in the year, followed in September by an unsuccessful search for someone to fill the position. The Central Council decided to research other options rather than try again. The outcome of our research has been to re-define the Fundraising and Fund Development job as a .7 FTE position, to make internal staff changes, and to outsource some portions of the work. In 2013, Liz Bachmann will add Registrar duties to her job description and hand over most of the financial administration tasks to an external bookkeeper; while Scott Douglas will continue in Program Administration and take on more responsibility in communications. Looking Ahead. CCS, along with other theological centres, is bracing for a cut of up to 30% to our annual United Church grant in 2014, which constitutes more than a quarter of our annual income. We are therefore seeking to increase our fund development capacity at several levels. We want to upgrade our computer database, and have secured the services of the Mikuska Group, a fund development consulting firm, to conduct an audit of our current fundraising practices and systems, to oversee the hiring and training of a new Fundraising and Fund Development officer, and to help foster a culture of stewardship throughout the organization. In 2013 CCS will begin a new round of strategic planning. The Central Council will be meeting face to face twice in the year to advance the planning. Their work will be significantly informed by the Program Consultation which took place at the end of January 2013, bringing together Program Committee members, program staff, and denominational representatives with selected experts in education, diversity, new technology, and church leadership. The Consultation was financially supported by The Anglican Foundation, The United Church of Canada, the Montreal Fund for the Diaconate, and the Western Field Based Fund. CCS is well governed by a strong and stable Central Council. Our monthly conference call meetings enjoy full attendance, and the time we spend for worship and check-in makes for smooth and efficient decision-making. I really appreciate the complementary gifts of our co-Chairs Jim Boyles and Carolynne Bouey-Shank. I also want to single out the outstanding work of the Volunteer Recruitment Working Group under Maureen McCartney’s leadership. They have rounded up a wonderful host of volunteers to help carry forward our mission in the coming year. Thank you. I believe CCS is doing well. We are richly blessed by staff, Friends, students, and benefactors, we are holding fast to our values and vision, we have weathered difficult times, and we are still able to be nimble and adaptive to changes in the meta-context. May God be with us in the days ahead. “Over the years my job has expanded beyond providing administrative support to CCS program staff and students, to include tasks like designing and maintaining the website and CCS blog. The events around the 120th Anniversary kept me hopping, especially with filming (and then editing and posting to Youtube and our blog) things like the discussion between Stan McKay and Raheel Raza on diversity and hope, the presentation of the Davidson Award for Excellence in Theological Education to Ted and Ann, and the recognition of Companion of the Centre Caryn Douglas. A highlight of 2012 for me was the introduction of “Second Fridays.” I think of these as CCS’s version of “TED talks” (and not just because Ted is the one who lines up the speakers). The combination of short pithy presentations on themes of practical theology which can be uploaded to Youtube with the in-the-room immediacy of discussion and conversation feels like a great opportunity for engaging people everywhere in reflection on deep questions. “’Diverse’ is the word that surfaces most often when I think about my work during the past year. “Working with students doing the Pastoral Care Year, the Social Ministry Year, two Reflection Years, two Integrating Years, and numerous Global Perspectives Experience trips has ensured learning in a wide variety of topics. It has also provided new insights about developing and sustaining learning communities and has ensured that reading about all manner of things continues to stimulate my thinking. Working with students and those who accompany them is a privilege. I do not have words to describe the depth of respect I have for these folks who open themselves to this learning journey. “Collaborating with Maylanne to develop and monitor a Prior Learning Assessment Review program and to determine testamur requirements former student who completed the program requirements in the ’80′s and was now seeking commissioning challenged me to be clear about the purpose of program components and imaginative about ways of achieving the expectations. 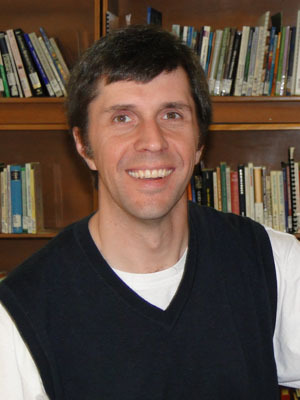 “Representing CCS at the UCC Saskatchewan Conference as part of a presentation on theological education and at the UCC General Council provided an opportunity for connection with CCS grads, colleagues in theological education, supporters, and potential students. “The Feast for Friends group has deepened my learning about the legacy of residential schools and the continuing impact of colonialism in our social/political/economic structures, our assumptions, and our ways of working together. The learning continues. “My responsibility related to financial administration continued through the first part of the year according to an earlier agreement. In preparing for the planned review of this arrangement, it became clear to me that I wanted to be able to concentrate my energy in program related work. So, at my request, this work shifted back to the Principal’s position with the exception of responsibility for the audit. I give thanks for the deepened learning about financial administration that resulted from doing this work during the past few years. I give thanks, too, for the opportunity to work with the members of the Finance Committee. CCS is blessed by the leadership, the commitment, the knowledge, and the hard work of these folks. “A highlight of the year was working with the planning team for the program consultation. This work was invigorating, life-giving, thought provoking and genuinely inspiring. Throughout the planning, I experienced the power of question to spark imagination, open windows of possibility, sharpen focus, set us on new path. I look forward to working with the report and to continuing to discern programming directions. “As in previous years, I enjoyed being with the students as they gathered for their Learning Circles in Winnipeg. In particular, when we gathered to honour our committed graduates at the Annual Service of Celebration , I was delighted to be a part of it. “The 120th Anniversary celebration allowed me the opportunity to meet many constituents from Canada and the US. The event not only allowed me to put faces to names but gave me the opportunity to speak with members of the CCS community who I saw were committed to living a theology of justice. “I love the rich variety of my program staff work: facilitating learning circles, responding to assignments, selecting readings, overseeing field placements. Vocationally, it fulfills me; I find it stimulating, engaging and meaningful. However, in 2012, these already satisfying norms of my work were wonderfully interrupted with new, imaginative and exciting initiatives. A number of opportunities emerged to deepen CCS’s connection to the Anglican community through retreats with the Diocese of Rupert’s Land Local Collaborative Ministries Teams in November, leadership of an Advent series at the local parish of St. Mary Magdalene, a diaconal Church gathering in the Diocese of Keewatin in January, plans for a diaconal event at the convent of the Sisters of Saint John the Divine in March, and an experimental series of monthly Eucharist services here at Woodsworth House. As well, last fall we began the work of the lunch and learn series, Second Fridays, with a number of powerful and provocative panelists. In October, the 120th Anniversary, and in January the Program Consultation at St. Benedict’s, added, significantly, to a rejuvenating sense of possibility and vision. The spirit of the Centre of Christian Studies came to fullness at the celebration of the 120th Anniversary of the Centre for Christian Studies and of diaconal ministry training held October 12-14 2012. The fullness of the spirit came into being not just for the past graduates and present students, CCS staff, Central Council, but also for the wider Anglican Church and United Church, the surrounding community of Winnipeg, other faiths and beyond. What an exciting time that was and continues to be! We thank the Central Council who with the CCS staff dreamed of the celebration to happen and worked so hard with the volunteers to have it happen. We thank the presenters, guests and participants. The celebration tied in so well with the clear focus of the need for CCS to look at transformation that grew out of the Face-to-Face meeting of Central Council last March 2012. Marion Pardy in her reflection at the Sunday worship to wind up the celebration, referred to the parable of the mustard seed. The seed that is very small is from an annual shrub and yet it grows into a huge plant. “Transforming hope can occur at the mere “scent” of water, as in a tiny mustard seed.” So too is CCS. We give thanks and appreciation for the work of Central Council members, members of committees and working groups. We especially thank the work of those who are leaving their positions: Roland Legge, (recording secretary), Brian Faurschou, (chair of Finance), and Debra Schweyer (chair of Human Resources and left midyear). We welcome those who have let their names stand for nominations. And we thank the work and ministry of our principal Maylanne, and our staff Ann, Ted, Scott and Liz and the students and the friends of the Centre for Christian Studies. Together we work toward a caring, just and sustainable world. As another year comes to close, so to has another learning module. 2012 saw the completion of the Pastoral Care Module and the beginning of the Social Ministry Module. Some of the students have continued from one module to the next with new students joining us in the Social Ministry module; others have moved into a reflection year or integrating year. Five of us graduated! Our congratulations to: Ingrid Remkins, Debbie Springer, Alice Hansen, Tracy Robertson and Vicki McPhee. As a student who is approximately half way through the process I have a unique view. There are those of us who are working to get our external credits completed and/or prepare for the coming circle, and then there are those of us who are completing their integrating year and posting the countdown to graduation on Facebook. In the coming year Mark Laird will step down from student council and Hubert Den Draak will be replacing him. Jackie van’t Voort will remain on Council for one more year. The Centre For Christian Studies provides a unique learning experience and I am confident that I can speak for the student body when I say thank you to all the volunteers who offer their time and wisdom to the regular running of the Centre, as well as all those who worked so hard to put together and participate in the 120th anniversary celebrations. What a privilege for those of us present for circles and participating in that event! Also thank you to the staff of CCS, who bring the learning experience to life. For much of the past year, the Chair rotated among committee members due to challenges in finding an individual to take on the responsibility on a longer-term basis. The Committee itself has met for about 12 hours over the past fourteen months, and its major sub-committee, planning the January 2013 Program Consultation, met for an additional twelve hours as well as attending the consultation for two days in late January. We are grateful to Mary Ann Pastuck and Elizabeth Smyth for their past work as part of this group. New Program Initiatives–The exploration of a variety of program initiatives focusing on short term events such as the Second Friday presentations, and workshops with a variety of partners, including the Anglican Diocese of Keewatin and Rupert’s Land, the Sisters of St John the Divine, follow up to the work of the Truth and Reconciliation Commission, the Sandy-Saulteaux Centre, and a program on Learning for International Faith Engagement and a workshop on Food Security. A proposed event in Edmonton in the fall was cancelled and we have not yet received a report on a second event in the late fall which was to be held in Calgary. Work is underway on developing a course called Interpreting the World, in partnership with Louise Cornell, Chair of the Rupert’s Land Deacons Committee The Program Committee is very cognizant of how much of this work has unfolded as a result of Staff initiative and creativity. Twenty four people participated in the two Leadership Development Modules held in the summer of 2012, and two are in planning for the summer of 2013—one in Winnipeg and one in Ottawa. The committee also has received regular reports from student and staff about the progress of the various Learning Circles in the Diploma Program. Over the past two years most of the formerly “printed” resources have been moved into downloadable form. The Staff have also been inviting new individuals to participate in the leadership of the Leadership Development Modules as a way to build capacity to offer this foundational element in the Centre’s program. 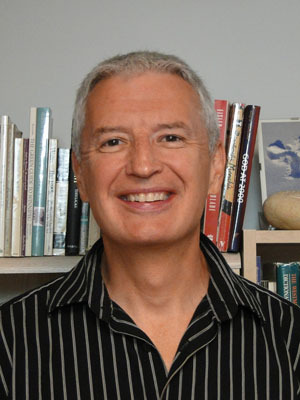 The Committee reviewed and approved Ted Dodd’s sabbatical proposal. This sabbatical will take place in 2013. In the process of seeking a Chair, the Committee reviewed and reorganized its mandate to clarify it role and functions, and the revised Mandate was approved by the Central Council in late 2012. The Program Committee received and forward to the Central Council the reports of the Awards Committee regarding Companions of the Centre and the awarding of the Kaufmann Scholarship to HyeRan Kim-Cragg.for her work “to develop a theology of resistance … in the context of global (neo-liberal) capitalism where the life of indigenous people and their land are violated due to mining.” Professor Kim-Cragg’s work will involve travel and learning with denominational and ecumenical partners, and action and educational work after its completion. We thank Marion Pardy, Elizabeth Brain, Barbara Hansen and Ted Dodd for their continuing work in the area of awards. The Program Committee also receives periodic reports from the Library Committee. Prior Learning Assessment and Recognition — The Committee has been puzzling over appropriate processes and standards for assessing the prior learning and experience of individuals entering the Centre’s programs. In doing this, it has proceeded both through research and learning about how this is done by other institution, and through our own action/reflection process. This began in the spring of 2012 with an individual who had made such a request, and over the past few month the Program Committee has been working with feedback from students and staff about the experience, and documenting and articulating the standards by which such assessment might unfold. This has led to extremely valuable reflection on the Centre’s program, the nature of experiential learning and the centrality of a particular model of experiential learning in the Centre’s program and work in formation for diaconal leadership. At least two critical questions are: How do we assess, or enable individuals to assess the types of experiential learning they have already had in relation to the Centre’s core models and processes? What then are the basic minimum non-negotiable elements of the Centre’s Diploma Program for individuals who bring considerable past experience and learning. The Program Committee hopes to bring a basic standards and processes document to the spring meeting of Central Council. Major Program Consultation — Over the past two years it became clear that it was important for the Centre to think forward about the nature of its program in the light of: funding shift; new potential partners both ecumenical and non-church oriented; new articulations of standards for formation for ministry at a national level in both United and Anglican Church and at a world-wide level for Anglicans; emergent educational theory and new technology; and shifts in global and national justice issues. In the light of this we planned and held a major consultation in late January 2013 attended by members of the staff, Program Committee members, and invited guests from the United and Anglican Churches, and others involved in education nationally and internationally. The event was facilitated by Andrew Reesor MacDowell and Pat Thompson who also worked over the fall with the planning group. All the faculty and staff prepared extended orientation letters to participants introducing and reflecting on aspects of the Centre and its program. The Consultation focused on several key areas: the Identity of the Centre and perceptions about that identity; the Program of the Centre and its Mode of Delivery; past, present and potential new Partners; the role of new Technologies; and Funding the vision of the Centre and its work into the future. The Program will begin its review of the extended notes from the consultation in late February, and will likely be bringing some initial reactions and questions to the Central Council at its April Face to Face meeting. Moving forward from this consultation will be a major part of the Program Committee’s work over the coming year. The Program Committee is aware of only the tip of the iceberg we see in the work of the Principal and Staff team in enabling all this to unfold with such care, planning, imagination, critical perception and passion. Working with them makes this a deeply rewarding and enriching experience. Members: Tim Sale, Jamie Bradshaw, Heather Collingridge, Ken Phernambucq, Maylanne Maybee, Ann Naylor (as needed), Brian Faurschou. 2012 was another year during which the finance committee had a full slate of items to work with. We had eleven monthly meetings and the two hours allotted seemed insufficient. In addition each of the finance committee members committed additional time for meetings with auditors, fund raising concerns, investment review, and property matter. The duties of the finance committee ask a lot from its members and in 2012 everyone fully contributed. All members of the committee are excellent, committed and are the reason for a successful year. The challenge from the Central Council as result of the face to face meetings was “transformation”. The finance committee has tried to be mindful of this concept when addressing some of the financial issues. If we commit resources, is the decision reasonable for the change and growth of CCS? Can we as a committee identify the core values of CCS and apply these values in our budget decisions? Move forward on the bursary polices and review changes for granting bursaries. Solidify investment policy changes, which are showing early beneficial results. Secure over $45,000.00 in grant money which is a level not previously seen. Review and revise CCS’s approach to future fund raising with a plan to implement changes that surely will be required because of the challenges for our funding. Initiated accounting changes to improve the financial information available monthly, quarterly and annually so that Central Council and finance can make fiduciary decisions based on accurate data. Improved our building by having the roof re-shingled, the exterior painted and obtained an independent report to prioritize future requirements for building maintenance. Finished 2012 with a budget surplus for the second year in a row. It would be easy to be pessimistic about the future. The United Church of Canada is reviewing their future and funding. There are alarming rumours about severe reductions to the funds CCS will receive from the United Church of Canada. The operating grant from the UCC is 30% of our budgeted income. In the face of direct challenges to the funding available and the inherent limit available from our committed individual donors we need to accept the challenges, reform our programs, find new funds and transform CCS for the future. External grants were applied for and received for a number of program activities, archival work and building improvement. The United Church of Canada grant, $4,050.00, Justice and Reconciliation for the March Learning Circle. The AnglicanFoundation, $5,000.00 for the program consultation. St Stephens BroadwayUC Foundation, $5,000.00 for the 120th anniversary. Montreal Fund for the Diaconate grant,$5000.00 for the program consultation. Investor’s Group $4,583, for management course at the Banff School. This year’s Fall campaign for donations exceeded last year’s fall campaign amount, which indicates the loyalty and commitment of our donors. We were sad to see Marc move on to another position in August of the year. Marc in his short time with us was instrumental in focusing our fund raising efforts, teaching us ways to improve our development efforts. His positive attitude and welcoming manner will be missed. The few members of the property working group were very busy in 2012 and accomplished a number of tasks. Replaced the picnic bench and cleaned up the outside court yard. Were more successful in having people come out to a work bee in May when exterior work was completed : sanded & painted metal fence, poured soil around foundation, pruned large shrub, replaced downspout. Co-ordinated research, printing and mounting of archival photographs in time for the 120th anniversary. Prioritized the work suggested in the building inspection report. Development and Communications Position – We spent considerable time this year dealing with this position, including an extended sick leave by Marc Desrosiers (incumbent), then a request to move to 0.7 FTE, and then resignation in July. We advertised and interviewed using the existing job description, but failed to find a suitable candidate. It was decided to alter the job description, making it a part time job focused on fund-raising. This led to changes in the Registrar and Program Administrator job (renamed Program Administrator and Information Coordinator), the Administrative Assistant job (renamed Registrar and Administrative Assistant), and outsourcing of certain finance tasks, all of which involved this committee and others. At year end, the position is vacant, with some tasks being handled by other staff, and a consultant working on a long term plan to fill the position. The goal is to find or train a person who will excel at fundraising and have a long term commitment to CCS. Principal’s Performance Review – This was conducted in February and resulted in Maylanne moving from probationary to permanent status. Comments received during the review were very appreciative of Maylanne’s leadership. Personnel Policies – We have reviewed CCS’s Personnel Policies, and have a new version to present to staff and Council. There are no substantive changes, but the new policies should be easier to understand, and in compliance with provincial legislation. Finance and Payroll – Committee members assisted as Maylanne learned these tasks and took over responsibility from Ann Naylor. Policy Working Group – The Human Resources committee has taken over the work of the Policy Working Group, which formerly reported to this committee. Plans for 2013: Continue with items 1, 2 and 3 above. Reflections: We are grateful to Janice Goldsborough for 4 years of work on this committee. The remaining committee is strong, with 2 active HR professionals, and a willingness to assist CCS with both day-to-day HR concerns and long-term strategic work. During the 2012 year, our membership changed a little as members took on other responsibilities in their lives. We are grateful for all those who contributed to our work this year. During the year our discussions included updating promotional materials which was timely as the majority of our work in 2012 was focussed around the 120th Anniversary celebrations for CCS. The new look of the website and information displays has received favourable feedback. The members of the committee are aware that while we hold CCS dear to our heart and are willing to share our enthusiasm with others, we do not have the skills to do the technology work. We are very grateful for Scott Douglas, and Catherine Pate and Saskia Rowley Fielder who share their skills with us, bringing dreams to reality. We need to acknowledge the hard work of Editors and Contributors to Tapestry. This publication has been discontinued, with the last edition being a glorious reflection on our Anniversary celebrations. Common Threads has received a face lift. Its new look is vibrant and inviting. We hope that some of the in-depth articles, reflections and themes that formed Tapestry will find a place in Common Threads. The committee acknowledges that there are those in our community who do not find electronic formats easily accessible. We will continue to explore ways of connecting with those folk on a regular basis. Promotional Materials & Connections. Are an important part of our work and the Committee would like to re-focus on promotional materials and their dissemination, including some of the advertising that is placed in national church magazines. We might include a discussion on encouraging the provision of portable and easily set-up displays for use across the country at various ACC and UCC events. The Tapestry Editorial Working Group be disbanded. That a Common Threads Working Group be established. The primary goals of the Common Threads Working Group would be to support and find content articles and themes and to establish network connections to provide content from various regions of the country. We would like to extend our thanks and gratitude for all those who assist in spreading the news of CCS. We acknowledge that without the shared talents and wisdom of the many this would be certainly be a much harder task. The Planning and Governance Committee has as its purpose to assist the Council in setting and monitoring its mission and planning, and to provide oversight of its records. In the second year of its existence, this committee has been engaged in a number of endeavours which are outlined below. With prior preparation through advance receipt of a set of questions formulated by the Planning & Governance Committee, Council members participated in a fruitful discussion of the current state of the Centre and the status of the Strategic Plan. The monitoring process utilized three categories: performance, relevance, and environment, and served not only to take the pulse of the current moment in the life of CCS, but also to provide the base for the visioning discussion that followed. A decrease in number of students and need to increase enrolment. Discussion ensued regarding means to achieve this increase. Promote CCS programs as valuable for everyone. It may be recalled that at the 2012 AGM recommendations were approved that modified the working group structure. In the course of this year those changes were implemented with revisions of the duties and responsibilities of the working groups that were affected. Letters of appreciation were also sent to those persons who had participated in groups that came to an end with those changes. Once again, the Planning and Governance Committee would like to thank all those who participated in the questionnaires and decision making processes that brought about these changes. The result has been a more effective and efficient governance structure to serve the needs of the Centre. Following the signing of the agreement between the Centre for Christian Studies and Manitoba Northwest Ontario Conference (the United Church of Canada) Archives at the University of Winnipeg for the storage of CCS files, a Manitoba Heritage grant provided funds for supplies and for the hiring of Taliah Klippenstein to work over the summer of 2012 with volunteer Gwenna Moss to prepare documents for storage. This grant and Taliah’s time were shared with the Conference United Church Archives. One of the outcomes of the working group review was that the recruitment and volunteer support functions were brought together into one working group with the expectation that these aspects of volunteer involvement would be better integrated. The group has sought to be supportive of all new volunteers and will be ensuring that notes of appreciation are sent to all those who are leaving their positions. Through the year the Recruitment Working Group has been primarily involved in filling the various Council, committee, and working group vacancies. Though the number of volunteer positions was decreased slightly with the working group changes, there remain a large number of volunteer positions in our governance model. Thus recruitment is a major task and we are very appreciative of the endeavours of this group. Their work will be summarized in the slate that is presented to this annual meeting. general agreement that on the whole, the By-laws say what Council wants them to say. The task group met with Heather Dixon again on January 22, 2013 to provide the Council’s input. The current Strategic Plan was developed five years ago and has been monitored year by year. It was designed for a five year time frame and thus is due for revision. The Planning and Governance Committee is planning a process for the April Face-to-Face meeting that will enable the Central Council to set the strategic directions and goals for the coming five years. The outcomes of the January Consultation will provide significant input to this process. Heather Dixon has now taken the input from the Council and will (soon, we hope) bring back to the task group a draft of the By-laws that will simplify the wording while ensuring compliance with legal requirements for non-profit organizations. In due time, the revised By-laws will be brought forward for approval. There will be ongoing assessment of the governance model as it is now structured. All committees have been requested to submit minutes on a regular basis to be sent electronically to the Administrative Assistant, the Co-chairs and the Principal. Members of the Planning & Governance Committee review the minute books on an annual basis to ensure that they are in order. The committee will also continue to monitor the progress regarding the storage of files and documents and the commencement of the new Archive Working Group. As the mandate of the Planning & Governance Committee is to “assist the Council in setting and monitoring its mission and planning”, it has been good to experience the openness and engagement of the Council with whatever the committee brings forward for its consideration. I observed last year that the Council had developed a sense of cohesion that served to enhance the clarity of the Centre’s mission and to plan with vision. This continues to be true and models ministry and learning in community that is a hallmark of the Centre. It is a privilege to take part in the life of the Centre and to have the opportunity to contribute to its mission. In the oversight role of the Planning and Governance Committee, we are observing with gratitude the energy and commitment of those serving on all of the various committees and working groups, as well as the Central Council. All of these groups also receive valuable and much appreciated support from the staff members of CCS in the midst of their already heavy workloads. (Our committee particularly wishes to thank Maylanne Maybee for her excellent support of our work.) Their grace and wisdom are gifts indeed. We look ahead to the coming year with anticipation and the assurance that we will be guided by the Spirit as we seek to live out the mission of the Centre and discern future directions. We applied for and received a Manitoba Heritage Grant which provided matching funds for hiring a summer student and purchasing supplies. The student, Taliah Klippenstein, worked 260 hours from late May to late September. Her work, under the supervision of volunteer Gwenna Moss, was largely sorting and cataloguing a backlog of files and printed material, most of which had been moved from Toronto to Winnipeg. The material catalogued filled 12 archive boxes, and the catalogue is 19 pages in length. This material is stored with the Archives of Manitoba Northwest Ontario Conference of the United Church of Canada located at the University of Winnipeg. Under the terms of the agreement CCS retains control of the materials in storage. In return we have a safe and secure place for our historical records. We were fortunate in having the guidance and support of Diane Haglund, Conference Archivist, throughout this project. Additional work was sorting and arranging photographs and scrapbooks which had accumulated through the years. Many of these were used in preparing the displays for the 120th anniversary. This event provided us with the opportunity to identify some of the photographs. Work remaining to be done is to put these photos into archive-quality photo holders (purchased through the grant), labeling them as much as possible. The anniversary call for memorabilia and archival material resulted in the donation of new material which we were pleased to receive. These donations add to the picture of student life through the years. We prepared a book containing the citations for all the Companions of the Centre along with a photo of the individuals. Finally, the summer student spent the last portion of the summer photocopying and printing minutes. We are close to the goal of having a complete set of council and committee minutes since the move to Winnipeg ready to be placed in storage. Motion: that nominations for Central Council be closed. Moved by Maureen McCartney, seconded by ___________. Motion: that the slate of nominees for Central Council be approved pending the approval of The Anglican Church of Canada and The United Church of Canada for the Anglican and United Church representatives. Moved by Maureen McCartney, seconded by___________. Motion: that the Volunteer Recruitment Working Group be empowered to fill the remaining positions on Committees and Working Groups and take these nominations to Central Council for approval via the Planning and Governance Committee representative. Moved by Maureen McCartney, seconded by___________. They also learned, from our Principal, Maylanne Maybee, that the word diakonia (service) means “through the dust.” It describes work that has to do with getting dirty, with walking urgently through the hard places to create change, to join in the work of making justice. This journey through the dust is guided by God’s vision of abundant life for all, a vision of lion and lamb lying together, of people listening to one another and understanding beyond the confines of language, a vision in which children are not born for calamity, in which no one does harm to another, where there is enough, where all of creation is loved and respected and considered as family, where peace and justice are known. Debbie, Tracy, Vicki, Ingrid, and Alice know themselves to be called to journey through the dust, toward this vision, loving the God who beckons them on. They came to the Centre for Christian Studies having lived in numerous places in Canada, one having also lived in Papua New Guinea. Their encounter with one another, with people they met on their Global Perspectives Experiences in Peru and Venezuela, and with people in their field placements in congregations, women’s shelters, food banks, community ministries and agencies and restorative justice programs, has deepened their sense of accountability to the hard places, to the margins . They are marked by the dust of oppression and injustice, by the ashes of despair … and they are marked by faith in a God who “leads us through the desert sands… leads us to a path of resurrection” . They are accompanied by a spiralling cloud of witnesses whose courage, persistence, compassion, and faith sustains them and reminds them who they are. Ingrid, Debbie, Alice, Tracy, and Vicki know how to speak hard truth, to offer a healing word, to support one another through the rough times, to struggle with integrity, to call forth the best in one another, to focus on that which really matters, to laugh and cry together, and to “get the job done.” They know what it means to be community and they know how to create community. As CCS staff and as their families, friends, mentors, and companions on the journey, we all have witnessed and learned from their growth and transformation, their deepening confidence, their commitment to travel paths that lead through the dust to justice and peace. Grounded in faith, they move forward from this place and time with strength and hope. We celebrate with them and we give thanks to God. At the Annual Service of Celebration in 2012, Barbara Barnett and Charlotte Caron were recognized as Companions of the Centre. 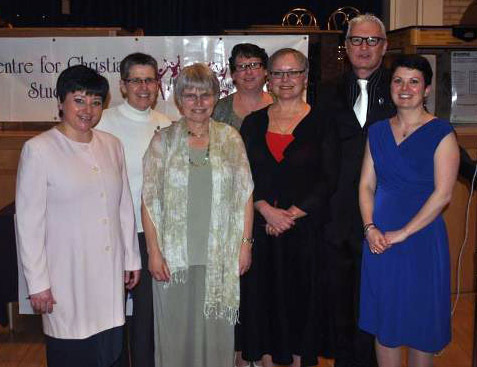 At the celebration banquet for CCS’s 120th anniversary, Caryn Douglas was recognized as a Companion of the Centre. Barbara Barnett: a woman of profound passions and commitment, a pilgrim of deepening consciousness and wisdom, a learner of curiosity and openness, a pastor of warmth and gentle respect, a prophet of tenacious and honest challenge, an educator of openness and imaginative spirit, an organizer indispensable and encouraging, a team player who acts with integrity. Barbara Barnett stands before you, today, as a most worthy Companion of the Centre for Christian Studies. Over the years, at CCS, she has served on the Volunteer Recruitment and Support Committee, the Development Committee, an Anglican Task Group, a Forward Planning Task Group, a Governance Task Group. She has acted as a Vocational Mentor and Resource Person at Learning Circles. She was a Peer Asker for the Endowment Campaign. She has, even, in the past, been on a planning group for this Annual Service of Celebration. And notably, she was Co-chair of the Central Council and served on its Executive for many years. Those years included some difficult discussions on the finances and the future of the Centre. Barbara never failed to discern, to question, and to offer suggestions and hope. She was always building and supporting relationships. 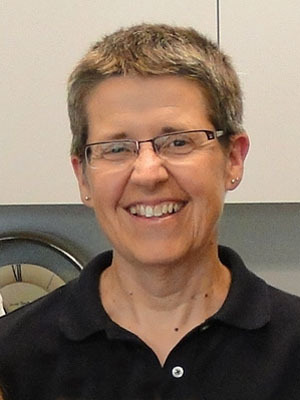 Following education at the Lycee francais de Londres , at the University of Manitoba in Arts and at St. John’s College in Theology, Barbara was ordered as a deacon in 1982, ordained as a priest in 1983, and appointed Canon in 1996 by the Anglican Church in the Diocese of Rupert’s Land. She holds certification in Institutional Ministry and in Gerontology. These certificates were connected to her professional work as Coordinator of Spiritual Care at Deer Lodge Centre where, during the stress and intensity of chronic and palliative care, she coordinated spiritual care for patients and residents, family and staff supervised other chaplains and community volunteers, educated students in a variety of field placements and seminars, coordinated worship and developed a proposal for an enlarged interfaith Worship centre. 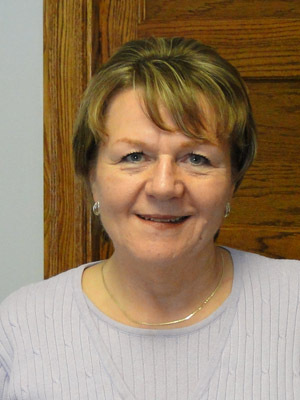 Prior to Deer Lodge, Barbara was Chaplain at Winnipeg Municipal Hospital, Program Director for Rupert’s Land Respite Care and chaplain at St. John’s College. She has been priest in charge at St. Catherine’s, Bird’s Hill, St. Thomas, Winnipeg, St. Stephen’s, Winnipeg. And she has served as Honorary Assistant at St. George’s Transcona and St. Peter’s, Winnipeg. 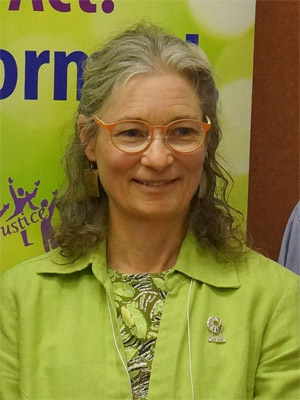 Barbara has volunteered for The Canadian Association for Pastoral Practice and Education working as secretary of Education Standards Commission, a member of the National Board, president of the local region, program chair for a national convention. Theologically, Barbara faces questions about faith without expecting pat answers, and she knows, at a core level of her being, that all life is relational and interdependent. She believes that creation and relationships are holy and sacred. Spiritually, Barbara is nurtured through singing, through the arts, through land and its creatures, and through relationships (especially her grandchildren). She has taken specialized Labyrinth training. She has engaged in learning with aboriginal elders. Educationally, Barbara takes joy in facilitating the learning of others. She is a creative teacher who readily employs the action/reflection model and who offers what is uplifting and what is challenging. She really enjoys leading birding and eco-education groups at Fort Whyte Alive. Her engagement in actions for justice are broad: care for children, projects related to housing for people with disabilities, and support for individuals experiencing crises in health. Barbara’s life epitomizes justice, from her attention to language, policies, and boundaries to her dedication to processes that are just and attainable. In confronting conflict, Barbara exercises tact and sensitivity but doesn’t back down if she believes that justice is being thwarted. From planting trees to environmental travel plans, Barbara models her belief in caring for our planet. Through the music of Carolyn McDade, Barbara has been a pivotal member of the Sacred Web Society which promotes eco-awareness. Barbara is known and valued for her leadership and extraordinary companioning of the centre, its students, staff and circles of friends and supporters. We believe that both her personal and professional life honour CCS and epitomize the ideals of the Centre. Her example encourages us to be part of the world, seeing it as it is and as it can be. Barbara Barnett it is a delight to name you Companion of the Centre for Christian Studies. 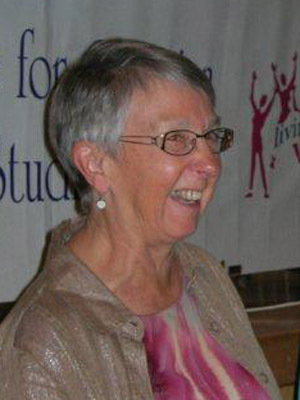 Charlotte Caron is known widely for her gifts and skills as a teacher, writer, and administrator, for her service as congregational and conference staff in BC, as an ordained minister, and for her leadership as a professor, dean, president and co-president at St. Andrew’s College in Saskatoon. To the CCS community, however, we know her as a diaconal minister, a wise elder, and a Friend in every way of the Centre for Christian Studies. I asked for the privilege of making this citation as Charlotte had such a significant influence on my decision to accept the position of Principal CCS – more than she knows. Almost a year ago (next month) I flew from Toronto to Winnipeg for two days of interviewing, feeling quite ambivalent about taking on CCS and uprooting myself from home and family, so close to retirement age. In the rotation of things, Charlotte was the first person I spoke to – she greeted me with a wide smile, twinkling eyes, and great intelligence and warmth. I remember her calm assurance that CCS was on solid ground after a period of transition, and that the job, though complex and intense, was do-able. When I visited Sorrento in September I attended the beautiful St. Mary’s Church, and learned that she had served as the pastor of this combined Anglican and United Church. 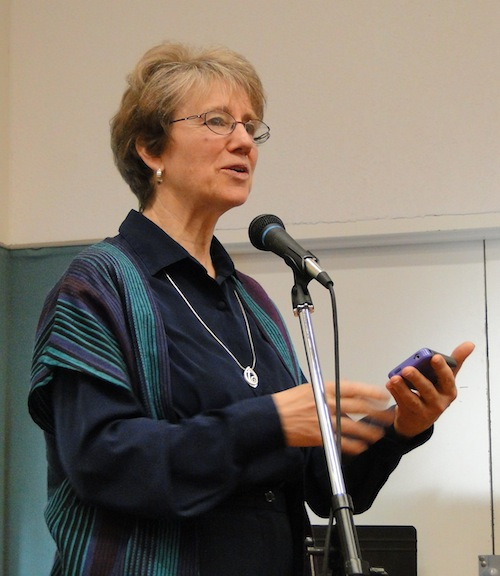 She also served in East Kootenay, Shuswap Lake and Windermere Lake, carrying a dual identity, as she does so well, as diaconal and ordained, Anglican and UCC. I have always believed that a major charism or core quality of diakonia is the willingness to be useful – and Charlotte obviously shared this sentiment since she realized that she would be more useful in shared United-Anglican ministry if she became an ordained minister. And so she did, but without diminishing in the least her foundational calling and identity as diaconal. Charlotte is a scholar. She graduated with a B.A. from the U of W as a student of distinction; she studied at the Centre for Christian Studies in Toronto, earned a Master of Divinity at Vancouver School of Theology, and won a doctorate in Women’s Studies at The Union Institute. She has written and taught with distinction – earning the Laura Jamieson prize for a non-fiction book advancing understanding of women’s experience (with the imaginative title of Not All Violins: Spiritual Resources for Women with Disabilities and Chronic Illness), a McGeachy Scholarship, a prize from Crossroads Press for outstanding scholarship women’s studies for her book, To Make and Make Again. She wrote Eager for Worship: Theologies, Practices and Perspectives on Worship in the United Church of Canada – (perhaps the Anglican counterpart would be Subdued for Worship! ), and contributed a chapter on diversity and ambiguity in The United Church of Canada: A History edited by Don Schweitzer. She is also a poet, with contributions in Measured Words: An Anthology, and Measured Words: Second Helpings. Indeed, more than one of her nominators for this award referred to Charlotte’s “brilliance” – it’s a good description, denoting not only her excellence as a scholar, researcher, teacher and writer, but also the shining way she has of sharing her knowledge – lyrically, imaginatively, invitingly. It truly sparkles. Charlotte took the Lydia Gruchy Chair at St. Andrew’s College, Saskatoon where she influenced a generation of students with her clear and principled feminist perspective. Above all, Charlotte is a friend of CCS. One of her nominators said that there are only two things she hasn’t done for CCS – serving as Co-chair or as Treasurer! I was astonished when I learned that she had carried the role of Acting Principal without salary over a period of months during Megan McKenzie’s sick leave and while things got sorted out for her appointment as Acting Principal (with pay). When CCS needed someone at the helm, “she was asked and she said yes, and her leadership brought stability in a great time of transition.” It sounds almost biblical doesn’t it? Especially as the Church remembers today Mary of Nazareth who also said “yes” – without fully knowing what she was getting into! The Church calendar also remembers Oscar Romero whose feast day was March 24. Among other things, he was a church leader and administrator who grew into much more and became a courageous witness to the values of God’s reign. Charlotte was also a church leader and administrator who has witnessed courageously to the values of God’s reign. She has acted with integrity, and asked the hard questions, paying heed to our stated values of education, theology, and justice. She has exemplified what CCS says we’re about. We often speak of the values of justice and inclusivity, yet putting these into practice is more than an act of good intention. Including others calls for respect, patience, and an ability to be generous towards those whose opinions and perspectives are different from our own. This is the kind of witness our world needs and the kind that Charlotte has given. Congratulations Charlotte. It gives me great honour to receive you as a Companion of the Centre for Christian Studies. I just returned from a five-day program that focused on “how remarkable women lead”. We’re here this evening to honour a friend and companion, a remarkable woman who has shown us how to lead. I was part of the transition team (of Central Council) when CCS moved from Toronto to Winnipeg. It was a difficult and controversial move that truly put us into crisis – a moment of both threat and opportunity. The break of continuity in staffing, the introduction of a new program model, and the re-location away from Toronto to Winnipeg posed serious challenges to our future and viability. Then along came Caryn who saw the extraordinary opportunity of this new moment. Somehow, deep within her bones, she formed and gave life to an amazing vision of what CCS was and could be. She doggedly pursued this vision, first as interim, then as Principal – working to find a place and build a staff team for this school that had already shaped her as a diaconal minister of The United Church of Canada. Many of her nominators and supporters spoke of Caryn’s sense of vision and purpose for CCS and its mission: her clarity, her persistence, her energy, enthusiasm, and determination in the face of adversity. To that list I would like to add her courage and openness to grow into the office, learning as she went. I saw Caryn help us do two things when we made the move: (1) transplanting and nurturing our greatest strengths: our educational model of adult learning, radicality, and reflective action, and our historic commitment to a diaconal style of ministry in all its giftedness and complexity; and (2) shaping and directing a new identity – not as a Toronto-centric school surrounded by theological colleges in downtown Toronto, but as a Canada-wide movement of women and men dedicated to diakonia: transformative leadership in social justice, pastoral care, and education. to unleash the power of inclusiveness – through her unwavering belief in the power of community among her staff team, her peers in ministry, the CCS constituency and beyond. Not only did Caryn create these connections and weave them into a greater whole, she helped them become a source of abundance and resourcefulness for CCS. As she told us in the panel yesterday, she realized early on that her role as principal would have to include fundraising. I was impressed to learn that upon launching a campaign to create a $1million endowment fund, she started by taking the necessary training to understand the nature of this task more fully. I understand why one of her champions said she was fearless! Caryn crisscrossed the country, went into people’s homes, made cold calls, wrote thank yous and scribbled marginal notes onto tax receipts. She persuaded and persisted her way through storytelling and over cups of tea – until we met and exceeded the goal of a $1million dollar fund, which to this day keeps us vital and nimble. She wove a community, which we see represented before us this evening. Caryn oversaw the transplant and made sure it took root. But she also gave us wings, making CCS more than a strong institution, but also an inspirational movement with denominational, ecumenical, national and global reach. As one nominator put it, she worked to build one great, mutually supportive community” – and I would add, a generous one too. We’ve already learned biographical information about Caryn, which I would like to break down by decade. In the 90s, she served as a sessional teacher at CCS (still in Toronto); as program staff at the Prairie Christian Training Centre (now Calling Lakes) in Saskatchewan; then as Educational Minister at Churchill Park United Church here in Winnipeg. 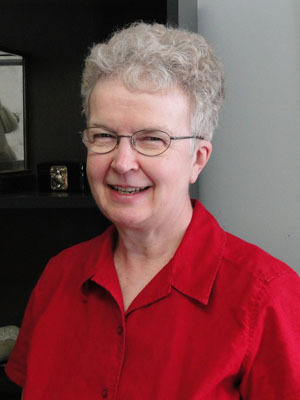 In the 2000s, she served as Principal of CCS, and worked toward her D. Min at St. Stephen’s College, Edmonton. Her leadership, scholarship and creativity have continued into the tens (?) – the second decade of the 21st century. Since leaving CCS, she has continued to support the diaconal community and to embody diaconal ministry in her paid and volunteer work. Academically, she completed a D. Min at St. Stephen’s College, with a focus on women’s leadership and the practice of disjoining – disallowing women to continue as deaconesses or as WMS missionaries upon marriage. She was recently awarded a McGeachy Scholarship for research into the history of women in the UCC who served as deaconesses in the era between 1926 and 1980. Caryn also gave leadership to a proposal for the relocation of General Council offices from Toronto to Winnipeg, staying the course as a tireless voice for transformation, justice and right relationships. She loaned her skills and time to a local mayoral race, to an organization to enhance the voices of aboriginal women, and chaired the board of UNPAC – the United Nations Platform for Action Committee. A quality of her energy is to give unstintingly to what she thinks is right, and not to be daunted or discouraged when she doesn’t win the first round! Caryn has made a difference. In her role as Principal, she established CCS in its new home in Winnipeg; and helped to build a proficient and collegial staff team. She built local connections, both institutional and individual – with theological colleges, the diocese of Rupert’s Land, and the MNWO Conference; and with CCS students, former students, and graduates across the country. She launched and managed the Giving Life, Shaping Justice Endowment Campaign; served as an educator, facilitator, curriculum developer, promoter of experiential learning in community. Caryn has shown a gift for hospitality – exemplified by placing her office at the front of the school, there to greet every visitor and student who came through the door. She has demonstrated qualities of persistence, wisdom, and courage. She has shown us a clear, visionary, and analytical mind. I would like to mention her ability to manage her health and energy – reinventing herself with healthy practices of spirit, body, and mind when facing health and spiritual challenge. Caryn has brought distinction to CCS, to diaconal ministry, and to transformative education. It gives me pride and honour to recognize, welcome, and name her as a Companion of the Centre for Christian Studies.